The Stylemaster folks at WestCiv have some online CSS tools that are useful. Make gradients, transforms, shadows and stroke text with these tools. Small icons on each tool show you which browsers currently support these CSS3 techniques. 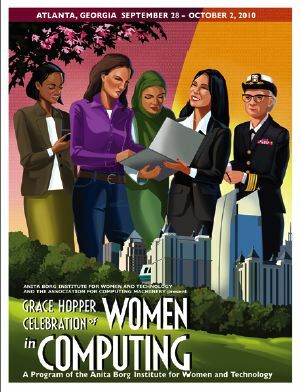 The Grace Hopper Celebration of Women in Computing for 2010 is themed “Collaborating Across Boundaries.” It’s set in Atlanta, Georgia, September 28 – October 2, 2010. The Electronic Frontier Foundation (EFF) has put together a tutorial explaining step by step how to get the most privacy out of Facebook’s latest attempt to fix its privacy nightmare. You might get a laugh out of Wired Pen’s explanation of Facebook’s Principles. How are you feeling about the new Facebook moves to capture and share your private information by making it almost impossible to find and set every relevant privacy setting in your account? I’m seeing posts like Top Ten Reasons You Should Quit Facebook and tutorials helping you find and set various privacy settings within the Facebook menus. Moveon.org has taken up the privacy invasion banner vs. Facebook. What’s your position? Express yourself. I’m talking specifically about sharing your whereabouts on social networks. Do you? The article Please Rob Me: The Dangers of Online Oversharing yesterday got me thinking about this. Sometimes I do promote the fact that I’ll be somewhere, for example if I’m trying to get people to attend something I’m doing at a conference. However, I generally don’t mention going away from home, even though there are people in my house when I’m gone. Even when you don’t actively push your whereabouts, there are still ways to figure it out. If I update Facebook from a computer with a Texas IP number, Facebook notices it. If I’m tweeting from somewhere in Chicago, Twitter notices it. Even if you think you aren’t oversharing, the horse is already out of the barn on privacy. I constantly see tweets and Facebook updates announcing specific locations for people: a specific coffee shop, a specific gate at an airport, a specific table in a specific restaurant. How much sharing of where you are is too much? Should we kiss our privacy goodbye? One of the scarier facts about online life is that privacy requires constant vigilance. There are ways to look at your purchases, your remarks, your friends list, and your other public data and learn a truly astonishing array of things about you. Privacy on Facebook has been in the news recently. Perhaps I should say privacy on Facebook is always an issue. Sara (the second commenter) made some interesting comments to this article by Chris Pirillo about Facebook’s Mark Zuckerberg’s recent comments on privacy. Apophenia (aka danah boyd) talks about privacy in Facebook’s move ain’t about changes in privacy norms. The TSA is talking about doing full body scans at airports, which may create images that can be saved and transmitted. Melanie Wyne watches what the FTC is doing about privacy to help real estate professionals run their businesses. I decided to reveal some personal information and let you see what you can figure out about me with the knowledge. I was listening to a new album while driving in my car and wondered just what sort of analysis a person could make about me by looking at the last 5 CDs I’d purchased. A mini case study, if you will. I buy CDs almost every month, so it’s a rich mine field of data about me. What am I telling an online marketing analyst by buying these items? Feel free to provide analysis of me in the comments based on these 5 purchases. Lacking anyone else to do it for me, I’ll tell you what I think they mean. See if your analysis agrees with mine. The Truth According to Ruthie Foster by Ruthie Foster. Here’s a video of her doing a solo of “Stone Love” from this album at a CD release party at Waterloo Records in Austin. I bought this CD in a local independent bookstore, so there might not be any digital trail about this purchase. The Fall by Norah Jones. Here’s a music video of “Chasing Pirates” from this CD. I bought it at iTunes, so it’s in a database. Blues Around the World , a Putamayo compilation. Here’s a recording of one of the songs from this album, this one is “Slide Blues” by Botafogo. This is another CD that may not have any digital tracks, since I bought it in a local store called Peace Craft that sells goods from around the world. The Orchard by Lizz Wright. Here’s a music video of My Heart from this album. I bought this one at iTunes. The List by Rosanne Cash. This is a rather clumsy preview video of the entire album. This one came from iTunes. Have you decided what you think my purchases reveal about me? Here’s what the iTunes Store recommends for me today. Are they on target? I’m not enough of a marketing person to know what my buying choices mean for sure, other than that I buy a lot of music. However, I promised an interpretation, so here’s my self-analysis. I think my choices show a strong preference for women’s voices. I think they show a preference for jazz, blues and country. I think they show an interest in music that is international, or not necessarily in English. I think they show a lack of interest in hiphop and top 40 music and an inclination toward lesser known regional or world favorites. I would conclude that these are the purchases of an older person—I don’t think many twenty-somethings are buying this music except perhaps the Norah Jones. Most of those things are true, with one exception. Rosanne Cash and country music. I don’t normally buy country music. I was attracted to The List because it carries a story about family and American roots that seems significant to me. Rosanne Cash is a good singer and I like women’s voices, so I can take a little dose of country for the sake of the history involved with the album. Here’s the story of The List , as told on NPR’s Fresh Air. Someone looking at this purchase would not know that was why I was interested, however. iTunes certainly considers me a target for country music purchases—you saw the recommended album by Steve Earle. Just knowing that I listen to public radio tells a lot about me. If someone tracked me for a long time, they might figure out that I buy artists based on hearing interviews with them on Fresh Air with some frequency. That would be some pretty fancy database infosharing, wouldn’t it? However, the Apple Store knows that I subscribe to the Fresh Air podcasts, and it also knows mostly what I buy. Could they connect the dots? What else does this little bit of data tell you about me? Do you see something I don’t? Do the two African American choices mean something? Does Norah Jones’ exotic background combined with the Putamayo choice mean something? If you didn’t know about the two CDs I bought locally, but only knew about the three I bought on iTunes would your conclusions be completely different? How much of my privacy have I given up with this story? Privacy. Does it have your attention yet? Privacy stories and concerns are everywhere. There are constant issues over privacy at Facebook. Look, for example, at 10 Solid Tips to Safeguard Your Facebook Privacy and at Could I have my stuff back, please. Privacy in Google Books has been an ongoing issue for the Privacy, Free Speech and Technology Blog at the ACLU of Northern California. TechDirt asks How Far Should Google Go To Protect User Privacy In Lawsuits? We keep hearing warnings about things that just won’t go away or be undone once they are on the Internet. The Digital Guidebook wrote Something to Think About: Your Digital Identity is the New Chastity. It’s considered laughable when eBay and Verison get privacy awards. We recognize the ridiculousness the award, as Dana Oshiro points out in Is This a Joke? eBay and Verizon Win Privacy Award. A new search engine called Yauba debuts that promises that you can search privately and leave no trace. I don’t know about you, but I read articles like that, or check out the search engine, I think a bit, then go on doing what I’m doing, what I’ve always done. Well, that was true. Then I saw What Information is “Personally Identifiable”? from the Electronic Frontier Foundation (EFF). Not if you’re Latanya Sweeney, a Carnegie Mellon University computer science professor who showed in 1997 that this information was enough to pin down Mr. X’s more familiar identity — William Weld, the governor of Massachusetts throughout the 1990s. Gender, ZIP code, and birth date feel anonymous, but Prof. Sweeney was able to identify Governor Weld through them for two reasons. First, each of these facts about an individual (or other kinds of facts we might not usually think of as identifying) independently narrows down the population, so much so that the combination of (gender, ZIP code, birthdate) was unique for about 87% of the U.S. population. But research by Prof. Sweeney and other experts has demonstrated that surprisingly many facts, including those that seem quite innocuous, neutral, or “common”, could potentially identify an individual. Privacy law, mainly clinging to a traditional intuitive notion of identifiability, has largely not kept up with the technical reality. Knowing just a little about a subscriber–say, six to eight movie preferences, the type of thing you might post on a social-networking site–the researchers found that they could pick out your anonymous Netflix profile, if you had one in the set. The Netflix study shows that those 10 deanonymizing digits can hide in surprising places. Our physical belongings also betray our anonymity by silently calling out identity-betraying digits. Small wireless microchips–often called radio frequency identification, or RFID, tags–reside in car keys, credit cards, passports, building entrance badges, and transit passes. They emit unique serial numbers. Once linked to our names–when we make credit card purchases, for instance–these microchips enable us to be tracked without our realizing it. The article goes on to mention other researchers who have been able to determine political affiliation using online data about music favorites and other information. The Gaydar software only seems to work for gay men. Apparently a woman won’t accidentally out herself by having lesbians in her friends list. What if you are a woman with gay men friends? Will the software crash? I’m being silly, but this is a serious topic. Could information about your sexuality or political affiliation make a difference to a potential employer? A homophobic neighbor? I think you know the answer to that. Now the report is almost 2 years old. I am wondering if perception about digital footprints has changed? Have we moved from trying to limit and prevent information about us to be published online (out of fear of privacy loss, identity theft or misrepresentation) to making sure that some trail of us, who we are and stand for can be found online? In what category do you fall? Worried, confident, concerned or unfazed? Are you as a teacher thinking about, developing, building, monitoring, and protecting YOUR digital footprint? Are you thinking about your footprint when (or not) posting or commenting on blogs, uploading student projects, participating on twitter, nings and other social network places? Do you keep your personal and professional digital footprint separate? Are you one to “hope for” or “not wanting” parents, principals, students and others finding a trail to and about you? Do you think that teachers are (will be) at a disadvantage in the future if they do not have pertinent search results when googled? If you aren’t paying attention to privacy yet, now is the time to get your head in the game and take a look at how you live your online life. Color me concerned. Want to get really down with the issue of privacy? There’s a symposium at Stanford in March 2010 you might consider. SXSW: Is Privacy Dead or Just Very Confused? Danah Boyd, moderator, with panelists Judith Donath, Alice ?, Siva Vaidhayathan. All three panelists are affiliated with universities. I’m mainly interested in this panel because I want to see Danah Boyd in action. I’ve been reading her for a long time and am impressed by her writing. I’m torn between watching this panel and the one on The Future of the Internet. Hope someone is blogging The Future of the Internet. Boyd has been talking to teens about privacy. Vaidhayathan is writing “Is Google the End of Everything?” He talked about how no matter how much we have in a public space (online), there is still a point beyond which privacy is invaded. He talked about that privacy is not a ‘thing’ that has substance and can be traded away in little bits. Privacy is actually a broad range of concerns about the collection and distribution of information about them. Alice talked about values. She said social media has value in the technology field. The also talked about the value of social support. Although there is value, there is also a release of information that can be aggregated and used to profile people. If you put information out there, can anyone use it for any reason? She says no. Donath talked about social visualization. How do all your social media contacts, email, etc., create a visualization of you? People have many public faces in many places. Should you have one large audience in mind or are there different audiences for your public persona? How many personas do you keep? Boyd: there is a scale of publicity that we’ve never seen before. What are the most important things tech has changed? Vaidhayathan says its about accurate targeting of goods and services. Erosion of comfort level about privacy. In the 70s, privacy laws were passed, but privacy laws undermined by Chaney and others. Interface between personal information and business is not separate from interface between personal information and government. Donath. We need to be able to “see” what kind of information we are leaving behind when we give information. If we could “see” what we are revealing, it might make us behave in a different way. The data trail is invisible now. In the past, you could reinvent yourself–most of history was not recorded. Now there is continuity that prevents you from leaving your past behind. Boyd. Most teens don’t consider home a private space. They had more control over their interactions on the internet, so felt it was more private. Alice. Social context determines the way information flows in that context. Moving information from one context to another is often consider a violation. New tech makes the contexts flow into each other. Personal choices about sharing in between contexts are being erased by technology. Is the burden on the individual or on the business that is collecting information about you? Should the default be that information is not shared? Vaidhayathan. Information has curreny. We have no way to know how our information is being used. Many people are unaware of the ways to manage information for their own good–checkboxes, switches, online choices, etc. Laws giving even the least sophisticated a level of control are needed. Donath. Things online can be taken out of context both now and 20 years from now. Everything is moving out of context. Privacy is the sphere of large scale institutional control. Other sphere is around our personal presentation of self. Boyd. Design is not keeping up with the way we deal with contexts and the merging of info. Vaidhayathan. Read Jane Jacob about surveillance. Need built in reciprocity in information exchange. Boyd. Inequalities in information flow. How do you see the issue of celebrity and social interaction? Alice. Not really reciprical even though the celebrity seems to be sharing. A sense of inequality between celebrity and audience. Culture of self-branding and micro celebrity is an issue. Donath. What is the value of the attention that is paid to us? What is the cost of every new person you ‘friend?’ How much do you value the attention that other people pay to you? Vaidhayathan. Someone who chooses to be engaged with the public deserves to have some say over what kind of information is revealed about them. What about people who haven’t chosen to be engaged with the public? No norms yet making a small avatar on a screen into a real person.